Are you ready to conquer the coffers of the casino? Let’s do it with Gladiators Gold. This simple but exciting slot game offers a plenty of winning combinations to grab a huge amount of real money. The online slot game offers 3 reels 3 bet levels and 3 play lines with conventional symbols to play on. It may seem that the number 3 plays the most important role in this game. But the reality is, if there is any important number in this game, then that is 7. The two highest-paying symbols of Gladiators Gold are 7s – one being red and the other one gold. The maximum payout is offered by Red Seven. The game developed by Microgaming is as easy as possible - starting from the features, bonus rounds and even special symbols – everything is created exactly the way many casino players prefer to have in an online game. Owing to its simplicity, this free game can be the best for the beginners. 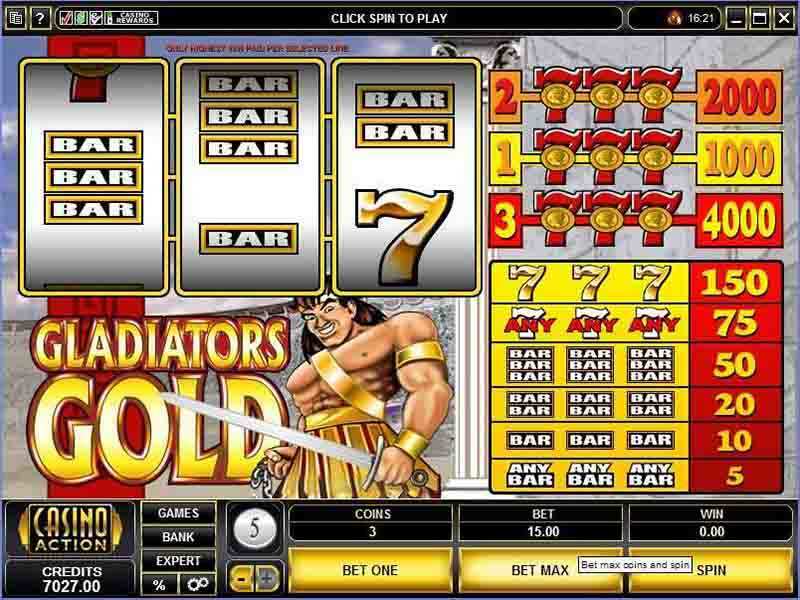 Gladiators Gold is a classic online casino slot from Microgaming offering a number of exciting features like other classic games. You are though restricted about what you can expect to do with wagers, with the stakes ranging from 0.25 per spin to 15.00 per spin of any Roman-themed classic game. You are able to win the standard symbols in this game. Landing any 3 bar symbols line ensures you to win 5 coins while you can bag 10 coins for any 3 single-bar icons. Landing 3-dhouble-bar icons would reward you with 20 coins while a grand total of 50 coins can be won with 3-triple-bar symbols on a single line. With any 3 seven symbols, you can win 75 coins while golden-seven icons will dish out a real money prize of 150 coins. As mentioned earlier, the Red Seven symbols are the most prestigious and thriving symbols of this slot game and landing those coins would let you win a non-progressive jackpot. However, there are 3 non-progressive prizes you can win altogether. This game is highly popular throughout the world, especially in the UK. As a classic Microgaming’s slot game, there is no special feature. However, the additional 3 pay lines somehow offer some excitement and hope of a large win even without any special feature. If you can land 3 of the Red Seven symbols on a single pay line, you can win a non-progressive jackpot. Landing these symbols on the first or the central pay line may wind up in a win of 1,000 coins. Landing those symbols on the second pay line located across the top of the reels can see you win 2,000 coins. If you can land the 3 Red Seven symbols across the third pay line which is situated across the bottom of reels, you can pocket a win of 4,000 coins. What you can have with this game is nothing but a larger version of any classic slot game. The creator judiciously decided not to use any wild icon that could push it more toward being a progressive video slot. If you’re looking for shields, swords, and anything related to the basic theme of this game, you are not likely to be satisfied. No download is needed to play the game. 0 responses to "Gladiators Gold Slot"